Spoilers for season 1 of Wynonna Earp within. 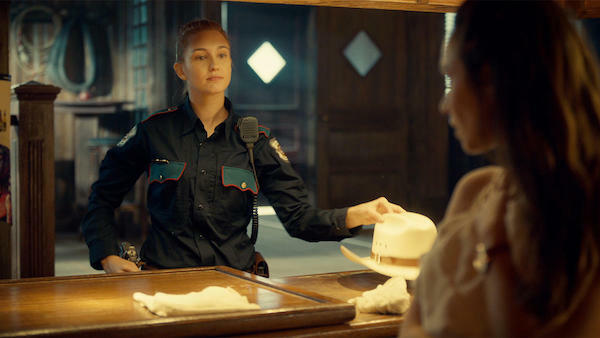 After a debut season full of sci-fi sass, action and romance, Wynonna Earp‘s season finale was exactly what we’ve come to expect from Emily Andras and her talented crew. After months of devastating and frustrating queer character deaths on television, the sci-fi Western series has been a refreshing change in direction. Wynonna herself may be the focus of the series, but it is most definitely an ensemble show. Not only do the queer characters Waverly and Nicole survive, but they have also become vitally important parts of the narrative. The Mary Sue spoke with actresses Dominique Provost-Chalkley (Waverly Earp) and Katherine Barrell (Nicole Haught) about the finale and playing such beloved characters. The Mary Sue: The finale is such a hugely epic episode, and there’s a moment where Waverly professes her love for Nicole and immediately after, Nicole gets shot and is saved by a literal bulletproof vest. That’s been a sort of joke of sorts for queer fans–“Hand so-and-so a bulletproof vest” any time a new lesbian or bi character arrives on the scene. This scene was filmed before the huge lesbian-death-apolooza but totally kicks the lesbian death trope in the teeth. LGBT fans have had a hell of a year, and Wynonna Earp and WayHaught are this bright shining light on the television landscape. What have you learned along the way about playing these vital queer characters? Dominique Provost-Chalkley: Firstly, I can’t quite believe that happened with the bulletproof vest! I’m so excited to see how the fans react to that, I can’t wait. Emily is just a genius, she really is. The chances of that happening are next to none, it’s incredible. So I’ve learnt a lot to be honest. I’ve learnt about the strength of the LGBT fans and how solid they are. They have been so involved with Waverly’s journey and although I wasn’t quite expecting this amount of support, I understand why they feel so passionately. It makes sense to me, and I just feel so honored to be able to give them the representation they deserve. I’ve also learned that as an actor the work you do is out there for life and what comes with that is a certain amount of responsibility. It’s so important to send out the right messages. I want to able to look back and be proud of the work I’ve done. Wynonna Earp and WayHaught is exactly that for me. I honestly think I will always look back and be proud of our awesome little show. Katherine Barrell: I wasn’t aware of the trope, this Bury Your Gays kind of movement, really until Wynonna came out because I actually don’t watch that much television because I find that it really turns on my work brain. And the television I do watch, I don’t really engage a lot online in the fan community. It was quite an education on just how media is portraying queer characters, the lack of representation and just I think opening my awareness up to very real struggles. A lot of these fans have written me beautiful letters about what Nicole means to them and things they’ve gone through in their lives and why she’s so important to them. I’ve said this in a couple other interviews, I think that because I live in a very liberal place—Toronto is a very vibrant, accepting and diverse kind of city—I think I lost touch with how hard it is for a lot of… I want to say anyone who is seen as a minority and that can be race or gender or whatever it is, but especially for the queer community in other cities. I just lost touch with how lucky and how unique Toronto is and I realized I was kind of living in a bit of a happy bubble that I didn’t realize how bad it was still in other places. So as far as I’ve learned, I think a huge education and with that kind of just deepening my sense of responsibility to this community and how happy I am to have been given…totally blessed to have been given the opportunity as an actor to do something more with my work than just be in a show and then it happens and it’s over. I really feel like that with Nicole I’ve been given a massive opportunity to actually make a really positive difference and I feel very proud of that and empowered by it. TMS: Dominique, something that endears Waverly so much to fans is the really authentic way she deals with her feelings for Nicole and her sexuality in general. What sort of feedback have you been getting from fans? DPC: The feedback has been truly moving. A lot of it has been exactly that—-how Waverly deals with her feelings. One of the most exciting parts of the show for me was showing Waverly’s journey of sexual discovery and the process of coming out. I honestly don’t feel like it’s spoken about enough. People are afraid to address how they truly feel for fear of embarrassment and not being accepted. I went to Musical Theatre School originally and the amount of people that came out during the course was incredible. Only when they were in an environment that the felt free from judgment could they be honest with themselves. I just find that so sad. Everyone should be able to embrace their sexuality wherever they are. I think Waverly shows that and I am so glad that the fans are proud of what we’ve done. Every time I hear that it has affected someone in some way it puts a huge smile on my face. TMS: Have you ever been involved in a project that has inspired such fan devotion? DPC: This has definitely been my first experience of a project that has brought together such a strong group of wonderfully devoted fans. Across the board the show seems to have affected and moved people, which is fantastic. I love how dedicated the fans are. It makes the whole process so much more enjoyable for the actors. Just knowing that they understand what we we’re doing with this show and that they get it. It really is more than I could have ever wished for. KB: No. (Laughs.) No, I haven’t. I mean, that’s the simplest answer. No, I haven’t. TMS: Was it shocking for you? KB: Yes! Definitely shocking–but not in a bad way, though. Just like, wow, this is crazy. I think that when it will hit me is when I start going to conventions because I’ve just been sitting in my living room, watching this show happen and looking at my computer. So I don’t really think I’ve had the face-to-face. I think when I get the face-to-face with fans, that’s really when it’s going to sink in. But I think, yeah, I’ve never had this experience before. TMS: You were like an overnight sensation and that must have been a really interesting position to be in. KB: Yeah, I think sensation is a really good word to use. I’ve talked to a couple of people about this idea of overnight success and I definitely wasn’t an overnight success because I’ve been grinding at this for years, at this industry. But I think sensation really applies to that character and I guess me being the face of that character. It happened very quickly. I would say within the span of like, three weeks, it went from zero to a thousand. TMS: We are impatiently waiting for word about S2, and I am pretty sure that thousands of lesbians would storm the barricades if for some reason it isn’t. Like Lez Mis. 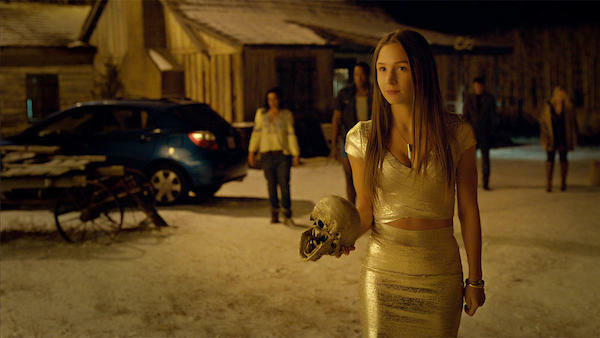 But that aside, what would you like to see Nicole and Waverly explore in a potential S2? DPC: Well this is all so new for Waves so there is a lot of exploring to be done. This really is just the start of her sexual discovery. However, Purgatory has a lot going on right now and so many things have to be addressed. As we’ve seen, a great deal happened in Episode 13 and some huge and very scary questions came Waverly’s way. Is she even an Earp? I think what’s coming may be tough for Waves, so a good shoulder to cry on wouldn’t go a miss. KB: As far as Nicole, I’d like to see more stuff with the other characters as well because it’s been a lot of focus on Waverly. It’s really important that Nicole maintains her individuality. I don’t want her to just be a piece of WayHaught. I want her to be involved and fleshed out in other aspects of her characterization. It’s happening in season one and I hope it continues. More scenes like episode seven with Wynonna and more watching her do her job and maybe interact with some of the other characters. I think if things are going to start to changing for the better in the TV landscape, especially with better queer representation, it needs to be about more than just the character in the relationship. Because that’s all fine and it makes us excited. I mean, who doesn’t love that? But I also think it’s really important that we need to see these characters in other aspects, other dimensions of their lives. Do you know what I mean? TMS: Absolutely, you nailed it right on the head. I think that’s been the problem this whole time. That at a certain point, I think a lot of people don’t know what to do with queer characters if they aren’t putting them in a relationship or are busy breaking them up and putting them back together. We’re people like everybody else. Where’s the drama that exists in our personal lives, outside of our relationships? I think you are exactly right. KB: For myself, for Nicole, I hope she continues on a path of where more and more aspects of her life are kind of shown on the show. 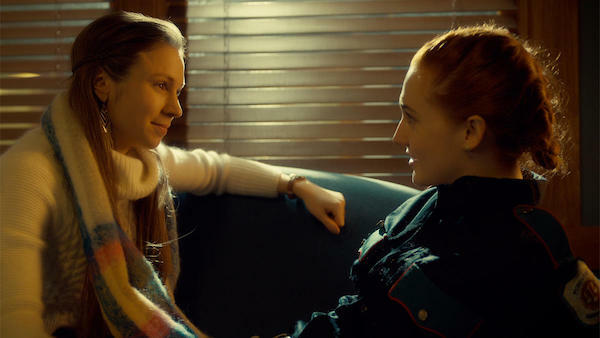 And for Nicole and Waverly as a couple, I think it would be really interesting to see them start to work together and see what the dynamic is like there. Because with any relationship, when you put people in a high stress or dangerous situation, it’s either going to bring them closer together or tear them apart and I think it would be really interesting to see how they handle it. TMS: Okay, some quickies: Doc-stasche or Dolls’ Lizard Eyes? DPC: Doc-Stasche. It has a life of its own, that mustache! DPC: Hmmmm, hard one. Maybe I’m going to controversial and say neither. I want more than anything Wynonna to be happy but I think maybe that will come from the strength of being alone first. That said, both of the pairings have very good chemistry and I’m excited to see what happens next! KB: Ohhh, I’m going to be so mean to Shamier [Anderson]. I’m a big Doc fan. I’m a big fan of Doc. Dana Piccoli is a pop culture critic and entertainment writer who recently relocated from New York to Greenville, SC. She’s a current writer for AfterEllen and Alloy Entertainment. She’s also written for Curve Magazine, Go Magazine, and PrettyLittleLiars.com. She’s currently writing a lesbian romance novel she’s hoping you will read one day soon. You can follow her on Twitter and Tumblr.